Sideshow Central, Sideshow Performers from around the world. 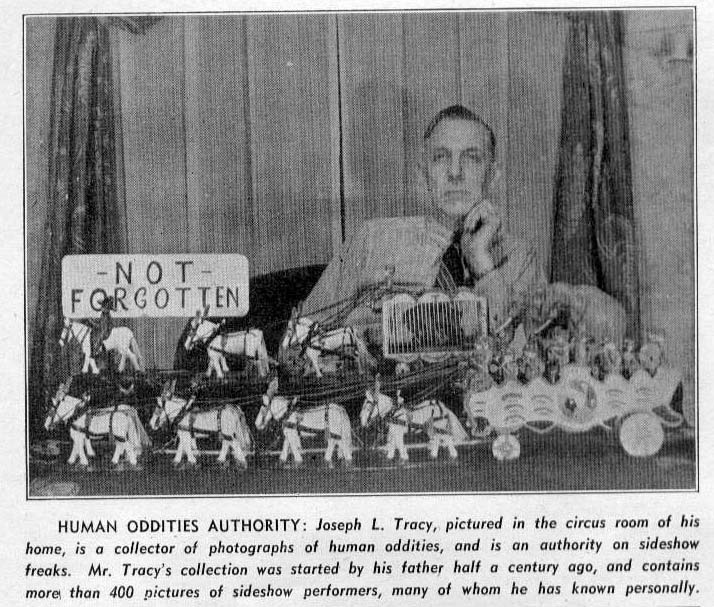 FOR MORE than 40 years, Joseph L. Tracy of Buffalo, New York, has been collecting photographs of human oddities of the circus sideshow and he is recognized as one of the country's foremost authorities on sideshow freaks. He will tell you that the tallest giant ever seen in this country was Antoine Hugo, eight feet, nine inches tall, who appeared with a sideshow in 1890. He is authority for the fact that Prince Nicholi, a Russian, who stood 18 inches tall, is the smallest midget who has been exhibited in the United States. And from his collection he can produce pictures of more than 400 strange people who have been stared at by the curious public in the past century. Back in 1890, Mr. Tracy's family lived at North Platte, Nebraska, near the ranch home of Col. W. F. Cody, who became famous as Buffalo Bill. The elder Tracy joined the Buffalo Bill Wild West Show as a bronco rider and fancy roper. And while touring with the show for a decade, he started a collection of pictures of sideshow personalities. In those days, few pictures were made of circus people and on show grounds. But every sideshow performer had cabinet photographs in quantity, which they sold to customers. For the most part, these pictures were autographed by the human oddities. When Joseph L. Tracy was 16, he joined the Al. F. Wheeler Circus a wagon show, as diver of a team of ponies which hauled the dog wagon. He remained with this show as an animal trainer until 1910, when he joined Barnum & Bailey Circus, and he was with other circuses until 1913, when he entered vaudeville with his troupe of trained dogs and ponies. In 1920, because his dogs and ponies were growing too old to perform and he was not inclined to train young ones for replacements, Mr. Tracy retired from the road and settled down at Buffalo, where he is now mechanic in a large factory. He started adding to his father's collection when he entered show business, but had the misfortune of losing many of the pictures in a rooming house fire at Albany, New York, in 1904. The few that he had left at home formed the nucleus of a new collection. For a number of years, he collected circus books, posters, programs, and other printed matter. However, he found that his circus room, which he equipped with furniture of his own handiwork, was too small for his ever-growing collection. So he gave up most items and concentrated on pictures of strange people. So thorugh has he been, he estimates there are less than a score of well known sideshow artists who have appeared in circuses during the past four decades, not represented in his photograph collection. Mr. Tracey has know personally many of the outstanding sideshow performers. Currently, there are 16 midgets working in a factory in his home town with whom he is acquainted. During the winters of 1906, 1907 and 1913, he lived at Coney Island, New York, and was a neighbor to such outstanding personalities as Francisco Lentini, the three-legged man' Edward Kissel, armless and legless; Grace Gibert, the bearded woman and many others. If you have a question you would like to submit email us at contact us here.